Posted by Every now and then, I get a craving for wings, burgers and bar grub. When I missed the last group "lets go eat wings!" get together, they dropped by my house after and they had packed a box of wings from Original Joe's for me and my boyfriend! Lol.. yup, my friends spoil me!! So shortly after, I was still craving bar food, so we dropped by to try them for lunch on a cool nippy weekend. There's a good selection of beers, cocktails and hybrid "beertails" - an interesting combo of both, which I'll have to try next time as it was my turn to drive. 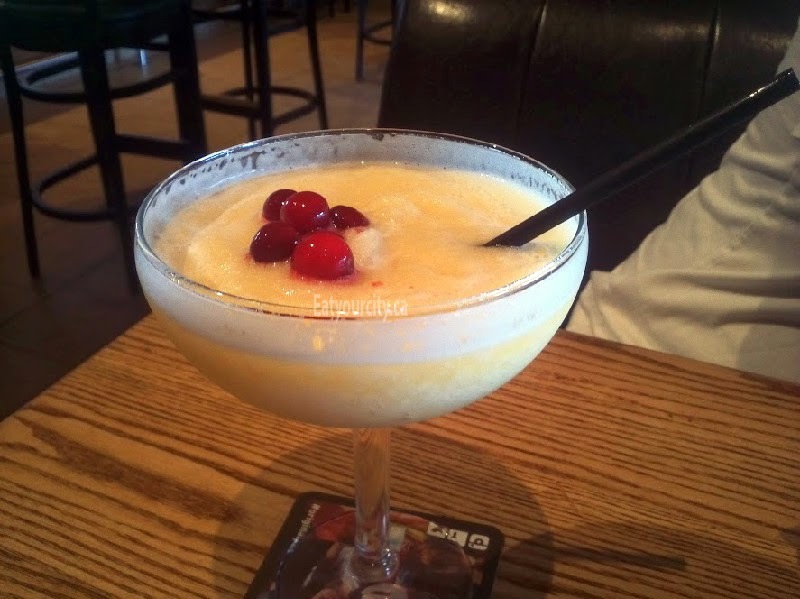 We gave the Patio Joe a try: Alize, Malibu Rum, pineapple and peach juice.. a nicely not too sweet slushy with tasty fruity notes, and topped with some sour fresh cranberries. Since were were both hankering for burgers, we didn't get a round of wings (no pic from the box of delivered wings, but they're a good size, nice and crispy) and were glad we didn't order too much food on top as the choice of 2 sides (out of 12) that came with each burger was quite filling! My boyfriend had the Kona burger served with 2 orders of Cesar side salad. I had the "Grilled Cheese" Burger - thick cut french bread slathered generously with garlic butter grilled with cheddar and swiss, with a juicy charboiled burger; topped with peppered bacon, melted provolone, all the groceries and I picked the deviled egg salad and the Cheddar Ale soup. 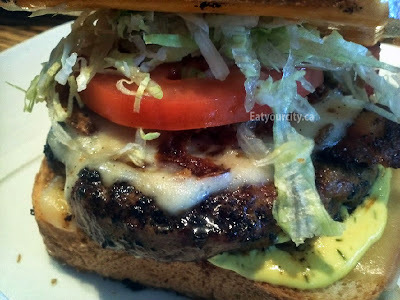 The burger was delicious, though messy to eat as the grilled cheese part was practically oozing with garlic butter.. kinda wished they just used complete (and smaller) grilled cheese sandwiches as the bun as the nicely melted cheese quickly cooled against the sauces and groceries. The deviled egg salad was nicely tangy with lots of diced pickles..
And the Cheddar Ale soup made with a hit of Original Joe’s red ale was creamy, cheesey and reminiscent of a cheesey dipping sauce. It filled up every nook and cranny of tummy space I had left. Overall, a surprisingly tasty place for bar food, burgers and wings with polite and prompt service. Will definitely be back and already looking fwd to when patio season is open again!